In the summer of 1999, the summer before my junior year in college, I lived in Boulder, Colorado with one of my best friends from home Aimee, and her teammates on the CU-Boulder ski team. It was a pretty epic summer on many fronts; living in a house with 6 guys and girls on the ski team and my teammate from Yale, Megan, enjoying all that Boulder has to offer. In a place that was only a few months removed from the infamous Columbine shootings (my summer teammate’s Dad was the lead investigator) we played pickup on fields every night with guys from more countries than we could count, practiced with the Denver Diamonds, which included the later Ballon D’Or winner Sawa, helped tag birds for a sanctuary and did pretty much as many fun and random things we could all summer, soaking in as much of it all as we could. Oh and also almost rolled a car down a hill when I forgot to apply the e brake and had to jump in at the last minute to save it, while screaming and having the whole neighborhood come running out to watch. It was a summer to remember on all fronts. In the midst of all this fun, I went to my first (of many) Dave Matthews concerts at the NFL’s Bronco’s Stadium on a warm summer night in July. I’ve been to many concerts before and since, and that one has always stood out to me. Usually concerts strike me as highly choreographed, songs and beats cookie cutter to the album that everyone listened to in the months leading up to the concert. While the concerts I’ve been to have displayed obviously an immense amount of talent by the artist, probably still smarting from watching Ashlee Simpson’s SNL lip-syncing moment, it’s all seemed choreographed to the point of where you don’t know what is real and what is fake. Which leads me to the goosebumps I felt watching Dave Matthews play that night. That night Dave Matthews blew me away just on the sheer zone he seemed to be and how he took one of his songs and just jammed out for what felt like ten or fifteen minutes, demonstrating a genuine talent, and passion, and fire in his music that cookie cutters don’t usually allow. We were all mesmerized as he went into another sphere demonstrating a feel and talent for his music that imprinted it’s memory on me nearly 15 years later. Wednesday night while coaching my U10’s I thought of that concert. 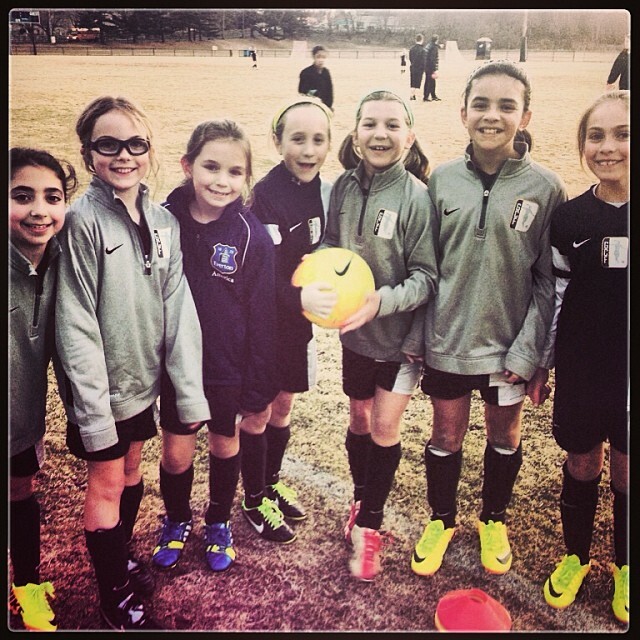 First of all, I have the greatest group of U10/U11’s. We’ve had them now since they were 6 or 7, and they blow me away on the field with their ability, and put the biggest smile on my face off the field. What cracks me up the most with them was that only about a year ago, they still were quiet and unsure of themselves, and now, they can’t tell me enough about their day, what test they had, or some funny story their brother told them that they’ve been dying to share. Wednesday night, we heard a memorized Christian prayer, a song about adverbs to the tune of Jingle Bells, and I was educated on state capitals. I of course love to rev them up, and then like a parent that allows their child to inhale a massive amount of candy before bed, after getting them all excited, I have to chameleon into a serious, militant coach to get everyone focused and ready to train. And train they do, like a bunch of serious little professionals. At a session this week, I had written out a detailed session plan to work on passing and receiving. I had the session planned to the minute, but about a third of the way through the session, I started feeling a high that I imagine my good friend Dave (Matthews) did at his concert fifteen years ago, and with the other coaches feeling like we were hitting something good, just dropped all our plans (the set list) and rode the vibe of where the session took us free styling the whole way to an amazing session which really was about letting the kids take the instruments and jam out with a little bit of guidance from us. After a technical warm up, we moved into partner passing, adding a few twists that started a little bit of chaos. We asked them, what do you guys think we should do to prevent the chaos? Their little hands shot straight up, “we should talk,” “we should help our teammates figure it out once we know where we should be,” “we need to make sure the weight of the pass is good.” What’s starting to get scary with these little guys, is that they are starting to be able to coach themselves and hit the solutions on their own, which is as the session moved forward I realized is a key component to making players be successful. Create chaos, and then give them the tools to figure it out by themselves. And give them the power to do so. After the partner passing, we moved into a complex passing pattern that they had struggled with a few days before. We talked again about how to communicate out of chaos, about how it was important to talk, but when a player that had to figure out where to go next, about how to talk in a way that didn’t add to their confusion. At first I jumped in to try and help them figure it out, but then it hit me, something that I struggled with as a younger player, looking to an authority figure to tell me the “right” way to do something, as opposed to allowing the kids to figure out the real “right” answer: that there is no right and wrong, and that’s where the growth as a player (and person) is: adapting, thinking, and figuring out the best way to get to the end goal. So then we just stepped back and told them to organize themselves and figure it out. And we spent the rest of the training session, mostly standing on the sideline in silence, as a bunch of 8, 9 and 10 year old girls organized themselves, communicated, and figured out a drill that some high level teams I have been on have struggled with. And I walked out of training that night with the same high that I felt watching Dave Matthews jam out 15 years earlier reminded of the lesson I learned that night: when one let’s go and trusts the beauty of the flow, the passion and ability that exists can have an avenue to pour out of, and it’s a beautiful thing to watch unfold.